Defense Secretary Jim Mattis smiles at a member of the German army as he speaks with the media at the Pentagon, June 20, 2018, in Washington. A week after U.S. President Donald Trump proclaimed North Korea no longer posed a nuclear threat, his top military official cautioned there are no new signs Pyongyang is doing anything to denuclearize. “I’m not aware of it,” U.S. Defense Secretary Jim Mattis told reporters Wednesday at the Pentagon. Pompeo has said he expects to return to North Korea soon to settle on details of the U.S. deal with Pyongyang. As part of that agreement, Trump has pledged to end U.S.-South Korea military exercises. Details on how that will happen, though, are still being worked out. 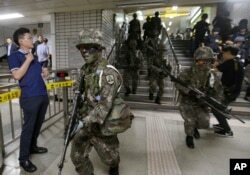 South Korean army soldiers conduct an anti-terror drill as part of Freedom Guardian exercise with the United States inside a subway station in Seoul, South Korea, Aug. 22, 2017. U.S. and South Korean officials expect to discuss the issue Friday, with consultations expected to continue next week when the U.S. defense secretary travels to Seoul. Mattis described the ongoing talks as part of the “usual, close coordination” between the U.S. and South Korean militaries. Mattis also said he had no update on when North Korea might return additional remains of U.S. servicemen killed during the Korean War, something Kim Jong Un pledged as part of the agreement in Singapore.